Come with 1 bundle, the Ombre blonde hair looks great and thick. It has dark color #1b on roots and #613 on hair shaft. The straight weave extension makes you cute and sweet, it is very suitable for hot young European girls. Hair originated from Brazil, so there will be no shedding when you run fingers through the hair. Different sizes are available, if you want 3 bundles in different size for a full head, please just add them in your shopping cart. 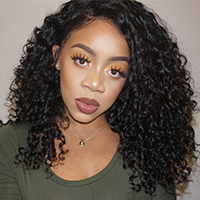 The straight hair could be curled and dyed into a dark color, the #1b color on hair root makes your hair look more natural when wearing this weave, like other types of hair on New Star, this 613 blonde hair is also soft and silky, to reduce hair shedding, it is better to lock the wefts back tightly after each-time wearing. And to keep this blonde hair tangling free, please use a wide-tooch comb to brush from the end in the way up every day. You can also directly contact us if you have any hair problems. good hair Review by Glam C.
This hair is good, feels very soft and silky. great hair Review by Iza C.
Quality is good, service was great. I have installed this hair for about one month now, it is still soft, no matting and shedding at all. good quality hair Review by Lucy H.
Very original and good quality hair, looks exactly the same as picutres.